Mark Foster loves the sport of coffee. The pleasure Foster derives from that experience has driven him from casual coffee enthusiast to part-time coffee entrepreneur. 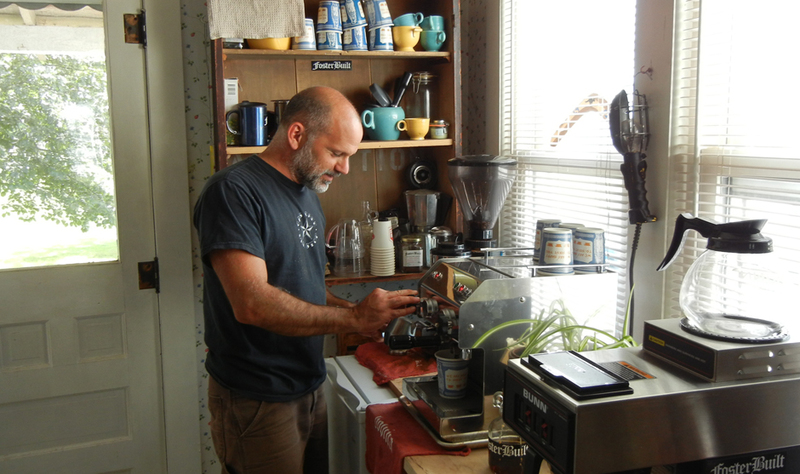 Since moving to the Delaware County town of Bovina in 2011, Foster has grown his caffeinated habit into a small side business called FosterBuilt Coffee. He roasts raw beans, seven or eight pounds at a time, on a converted gas barbecue grill in his yard on Bovina’s main drag. The beans retail at a few Catskill locations such as Russell’s General Store and Brushland Eating House restaurant, both right across the street from his house, as well as Tay Tea shop in Andes. The beans retail for $24/pound, and are also available in bulk by ordering online via his website. Foster has a few restaurant customers in the city, including Willow in Brooklyn. He also hooked a bunch of his professional colleagues on his beans. As a film director specializing in commercials and documentaries, Foster still works part-time downstate with a variety of video production companies. Watching runners bring endless cups of java from the nearest Starbucks while on set inspired him to pitch a different model. He persuaded several of the companies he works with to buy their own brewing equipment and make their own coffee using his beans, at a significant cost savings. 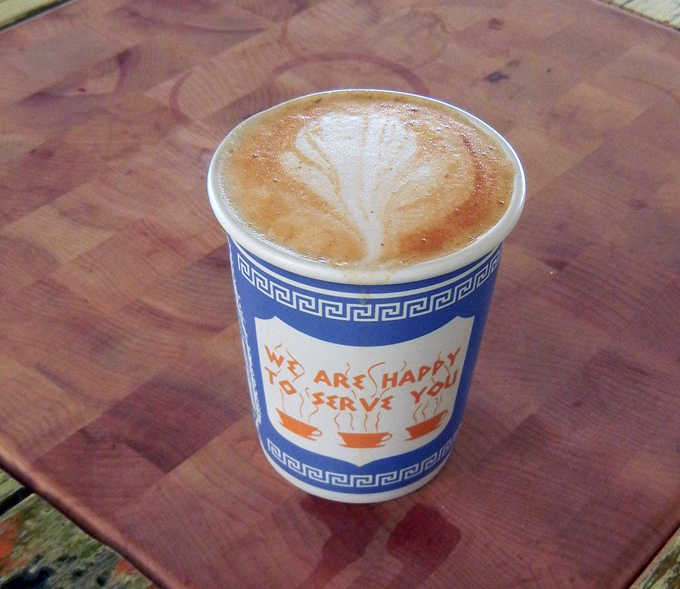 FosterBuilt’s raw beans come from Crop to Cup, an importer based in Gowanus. Foster buys them in 150-pound bags, and is currently roasting three varieties: Sumatra AAA; Mexico Canoas, Colima; and Burundi Buhorwa Lot 1. 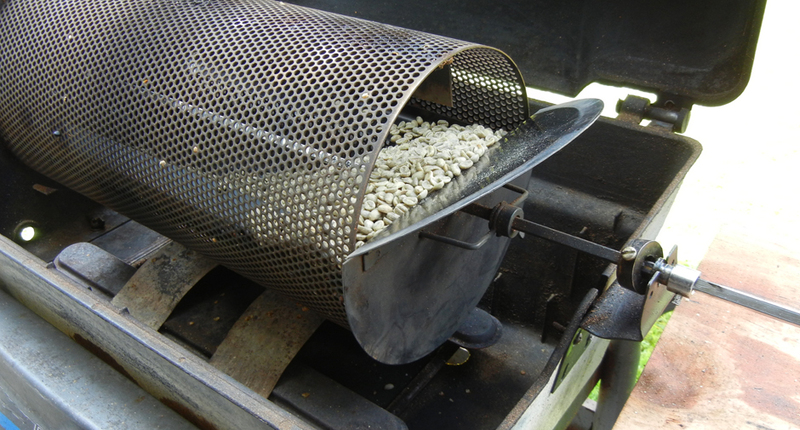 He started with a tabletop roaster with a one-pound capacity, which he soon outgrew. “I was roasting beans for friends and neighbors and a few customers, and I couldn’t keep up with the demand,” he said. A long-time designer and tinkerer whose other side business is building bicycles from scratch using vintage parts, Foster began sketching plans for a larger roaster that would employ a grill as a heat source. Shopping for parts on eBay, he found someone had already invented the exact gadget he was designing. He bought a kit that included a cylindrical metal basket with a 20-pound capacity, which mounts on a skewer attached to a 60 rpm motor. The whole thing sits inside a propane-powered barbecue grill he got for free: a Bovina town councilman popped by one day to report that there was a used grill at the dump and asked if Foster wanted it. “He was just being neighborly,” Foster said. The raw beans rotate over the flames, crackling and popping, for about 20 minutes, depending on how dark a roast the customer wants. They cool in old-fashioned pressure canners with the steam valves open to let the carbon out, and then are packaged in half-pound, one-pound or five-pound bags. Foster’s coffee business has led to a related gig coming up in October: he’s building a historically correct coffee shop — on a trailer — to serve his brews at The Race of Gentlemen, a living history event celebrating the early days of car racing, which takes place annually in Wildwood, N.J. Settling in the creative community of Bovina has led Foster to launch several other projects. With help from Wayside Cider proprietor Alex Wilson, he founded Winter Moto Camp, a cold-weather motorcycle gathering that’s coming back for a second round this winter. Tomorrow, he’ll host another event he created in 2013: the Bovina Open Barn and Studio Tour, which showcases farms and artists’ spaces. FosterBuilt Coffee will participate in The Bovina Open Barn & Studio Tour Saturday, Aug. 22, from 10 a.m. to 4 p.m. Visit the tour website for more info.